It’s that time again, time for me to reveal the contents of this month’s Ecocentric Mom box. 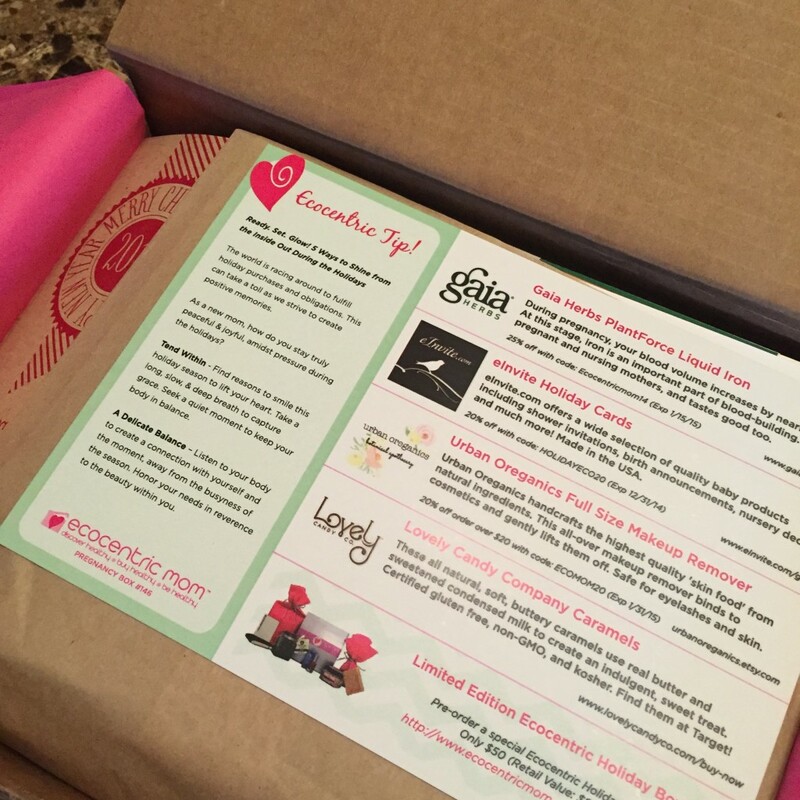 Ecocentric mom is an every-other-month subscription box for pregnant women, new moms, and babies. Each box is filled with goodies and samples of different eco-friendly products. Each box is only $24 and would make a great Christmas or baby shower gift. Urban Oreganics Makeup Remover – Handcrafted makeup remover from natural ingredients. 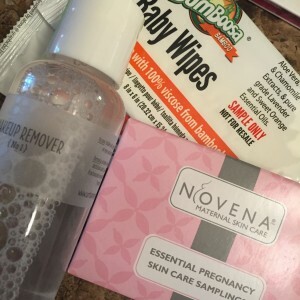 Safe for your entire face, even during pregnancy. Save 20% off orders of $20+ with code ECOMOM20 (expires 1/31/15) at www.urbanoreganics.etsy.com. Little Pim CD – Designed for children ages 0-6, this CD introduces children to the spanish language through entertainment and immersion. Available at www.littlepim.com. 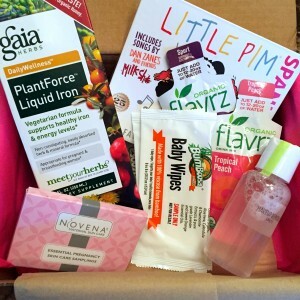 Flavrz Water Enhancer, Novena Skin Care Sample Pack, and Bum Boosa Bamboo wipes are just a few of the other goodies you can find in this months box. 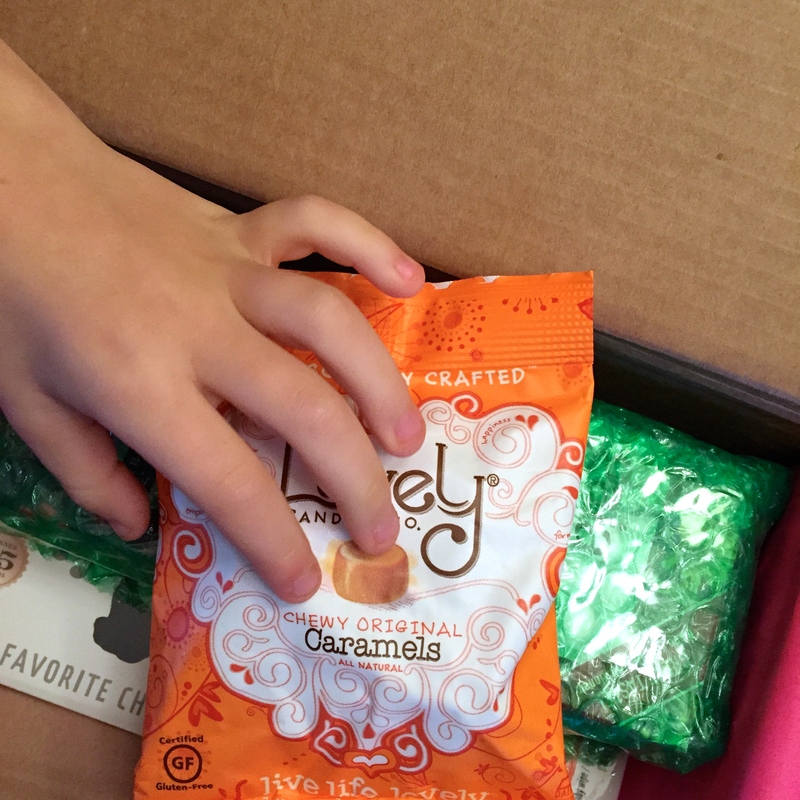 Finally, the one that was most well loved and disappeared first was the Lovely Candy Company Caramels. They are all natural, soft buttery caramels made with real butter and sweetened condensed milk. These caramels are gluten-free, non-GMO, and kosher. You can find them at Target (runs to the store to restock!!!). For a limited time, you can get a Limited Edition Ecocentric Holiday Box for $50 that is filled with over $90 worth of indulgent, eco-friendly products!! To subscribe for the holiday box or the regular every-other-month subscription service, visit Ecocentric Mom today. 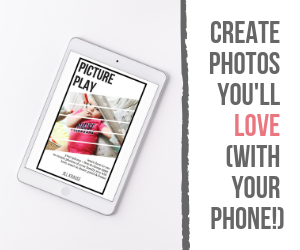 Disclosure: As a mom ambassador for Ecocentric Mom I receive the subscription service free of charge so that I can review and share them with you. I also receive a small commission if you decide to subscribe. Affiliate links are present in this post.